Roasted mushrooms... YES PLEASE!! Came across these beauties on the chunkychef.com. 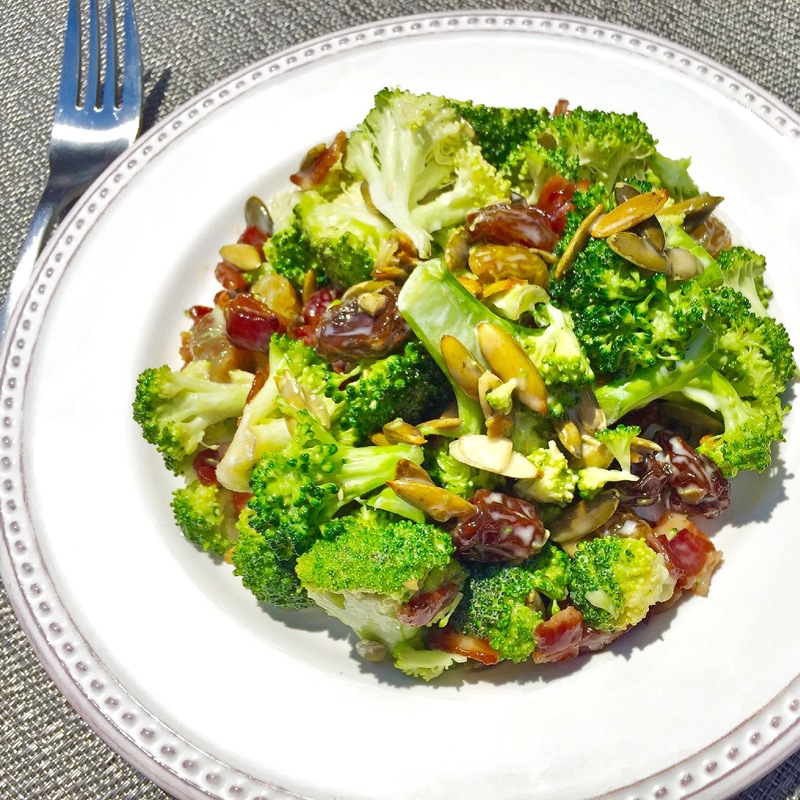 Side dishes that are easy AND delicious are hard to come by. I also really love things that look so gourmet but were actually a 5-10 min prep. Simple and flavorful! Hope you enjoy as much as we did!! ~ Line baking sheet with aluminum foil. ~ Toss mushrooms with oil, garlic vinegar, thyme, salt and pepper. ~ Wisk together tamari, balsamic, olive oil, sesame oil, honey, and garlic. Then add green onion and give it a little stir. ~ Place flank steak in a large ziplock bag and poor marinade over. tightly seal ziplock and let marinate in fridge over night... flipping bag from one side to another every once in a while (don't wake up in the middle of the night to do this, that would just be crazy). Feel free to marinate for less time if needed, a few hours is good. ~ try to bring steak to room temperature before cooking by taking it out of fridge an hour or two before. ~ Heat a large skillet on high and add 2 tsp of olive oil. Remove steak from bag and place directly in skillet. Sear for 2 min on each side. ~ Place seared steak on a baking sheet and put into heated oven for about 8 min (medium-rare). Feel free to cook longer or shorter for desired taste. ~ Remove from oven and transfer steak to a cutting board. Let steaks rest for 5-6 min before slicing. ~ Drizzle a little caramelized marinade (directions below) over and serve. We like to place the extra marinade in a jar at the dinner table... always adding more while eating! ~ Transfer the leftover marinade from ziplock to a small sauce pan and heat over medium until reduced and starts to thicken just a bit (Stir consistently when bubbling to prevent burning). Will thicken a little as it cools as well. This dish is the definition of EASY!! Remember I'm a mom NOT a chef and 90% of my recipes are going to be super fast and easy... I could make my own Salsa Verde but lets face it, I don't have the TIME. And when I don't have the time to make something from scratch, I try to find the CLEANEST ORGANIC version. The things I look at the most are gluten, sugar, corn, and any unnecessary ingredients (Yucky/toxic/crap/make you feel terrible/can't pronounce/give you a hangover... Shall I go on?!). These are the big NO NO's in my book. Just because it say's organic doesn't always mean its great for you... you still have to check the ingredient list! 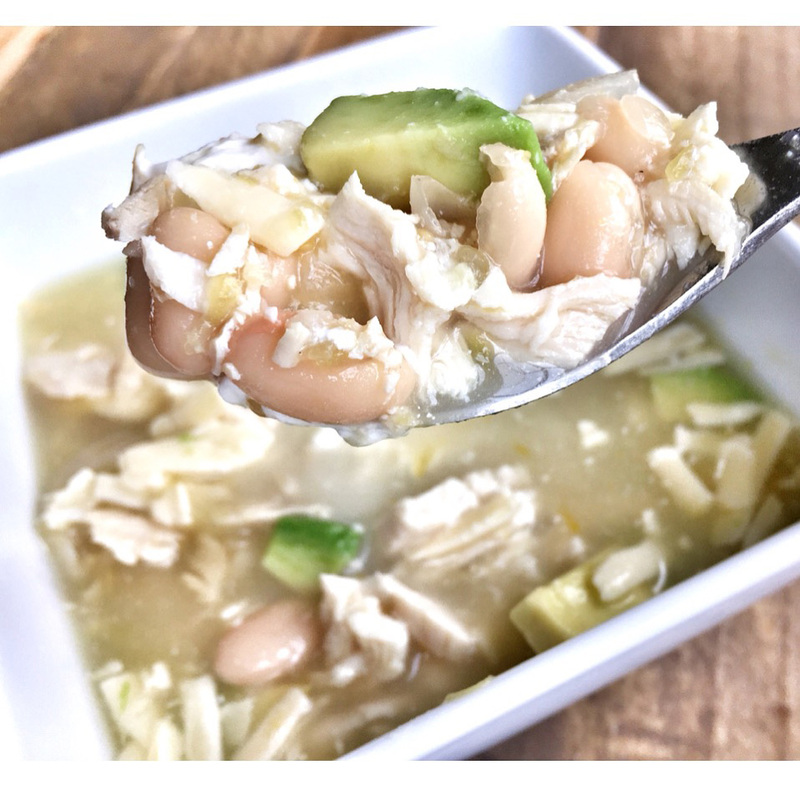 Hope you enjoy this easy and delicious soup as much as we do! Note: Sometimes I add chopped zucchini just to get some veggies in there! This is a BBQ hit and kid approved! Great way to get kiddos to eat some GREENS! Just made this for a Park BBQ last week and everyone was asking me for the recipe... so, here it is! Enjoy!! ~ Cook Bacon on skillet until brown and slightly crisp. Cool and crumble. ~ Combine all salad ingredients. ~ Mix dressing in separate bowl and then pour over salad and toss. ~ Let refrigerate for at least an hour before serving. Enjoy! Note: Feel free to add more Raisins or Pumpkin seeds to your liking... This is a super easy recipe to play around with add more of what you like!! OK... OK... I know it's literally been FOREVER since I've posted ANYTHING!! This last year was C-R-A-Z-Y to say the least... lots of traveling, having a baby, and moving across country!! I definitely put my blogging on hold... but I'm back!!! 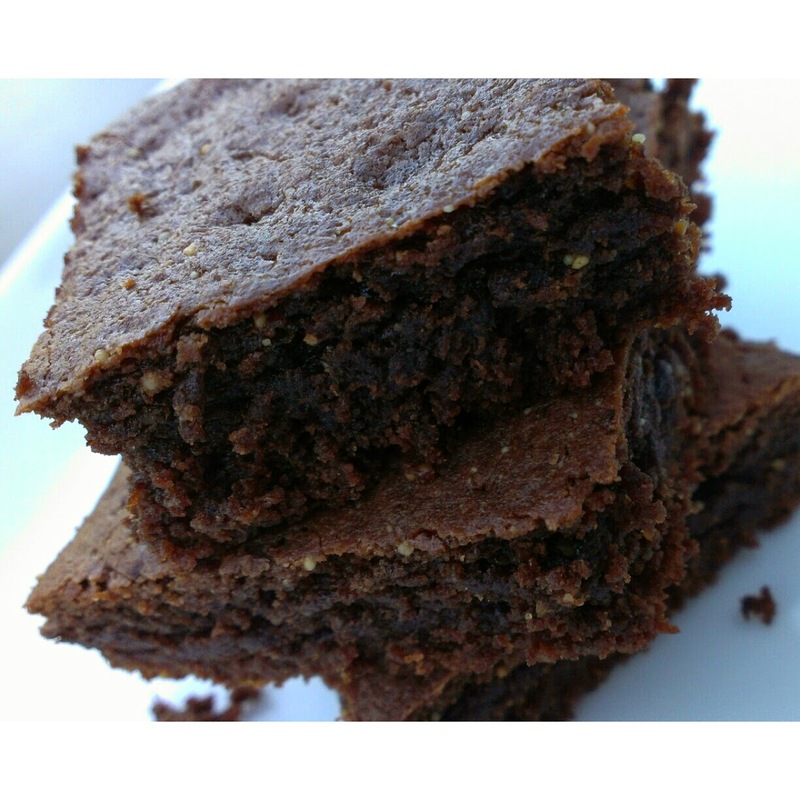 You could say these brownies inspired me to blog again... they're that good!! I have been searching and searching to find, or create, a really great HEALTHY brownie recipe... FOUND IT!! My friend and practically 2nd mom, Tammy Windsor, introduced these bad boys to me but in the form of cookies.. they were delicious!! While going through the recipe it dawned on me... "This would make the perfect brownie!" So I just made a few changes and turned them into moist gooey brownies! My husbands exact words "WOW, these taste like real brownies!" Especially with hitting that New Years resolution of getting back on track to a healthy lifestyle, these have been making that possible! It feels like I'm cheating but I'm NOT... I love that feeling! Anyone with me?! It's that good! ~ In a large bowl, mix together almond butter, honey, and eggs. ~ Add cocoa powder 1/4 cup at a time, baking soda, vanilla, salt and mix until completely combined. It should be a very thick dough and may need to use your hands, worth it! ~ Let cool and set for about 20min before indulging. NOTE: Brownies will rise high while baking and then sink a little while cooling, that's normal. Cold, fresh, and delicious! Great for summer BBQ's or a nice simple dinner at home! This salad is amazing with grilled shrimp!! Oh hot summer nights how I love you... nothing better than grilling outside while the kids are playing in the yard! It's the small things that get me!! ~ Place cooked quinoa in fridge for at least 1hr. ~ Cut all veggies. Mix dressing in separate small bowl. ~ Remove quinoa from fridge. 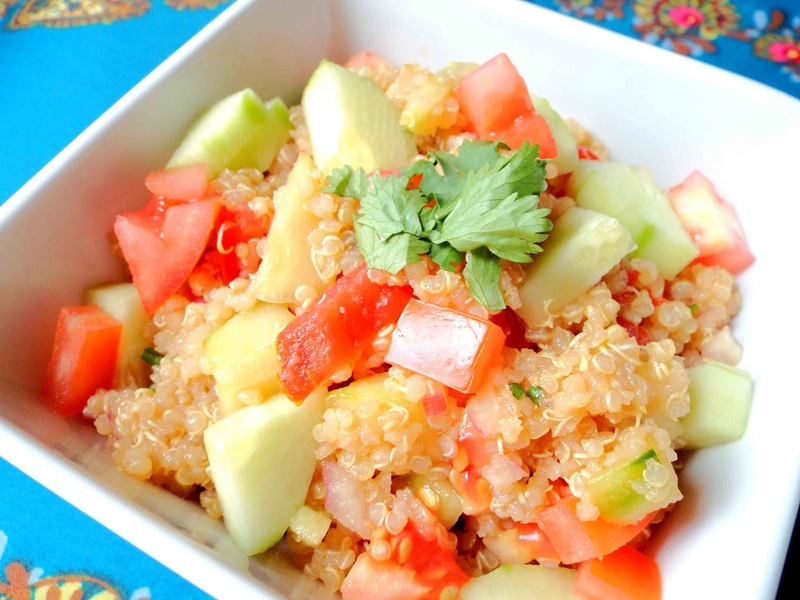 In large bowl toss quinoa, veggies, and dressing. Hot night in the Desert called for these babies!!! You won't be sorry!!! Sweet and Salty... probably every women's perfect combination of flavors!! ~ Slice dates in-half but not completely through (butterfly cut). Place 2 dates on shrimp (1 lower, 1 higher). ~ Wrap shrimp and dates with bacon. use toothpicks to hold in place. ~ Grill until shrimp and bacon are finished and crisp. 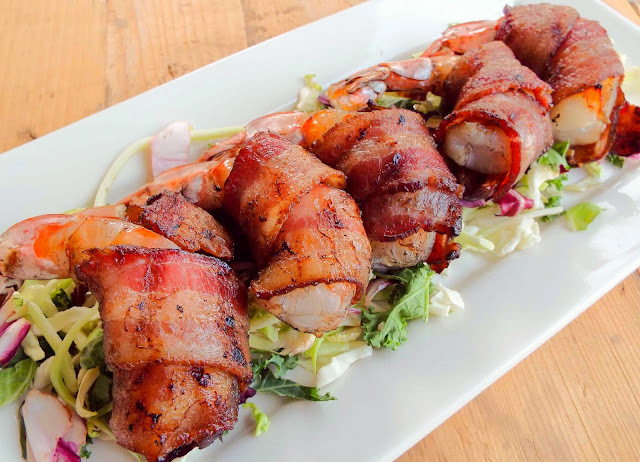 *Tip- try not to double layer bacon when wrapping shrimp... under layer won't cook as well. Mexican Beef Stew - "Cook With Me"
The Best Shish Kabobs - "Cook With Me"
Although not stated on each recipe, I use all Gluten Free ingredients and mostly organic when possible.